Sgt. 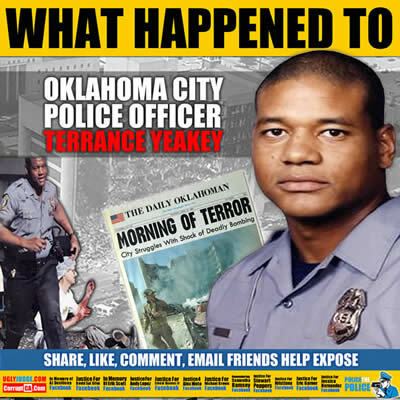 Terrance Yeakey was an Oklahoma City Police Officer, a first responder to the OKC bombing, and an American hero. Officer Yeakey, known to friends as Terry, saved the lives of eight people from the Alfred P. Murrah building on the morning of April 19, 1995. Where Was America’s Outrage When This Police Officer Was Killed? Terrance Yeakey was a few blocks away from Timothy McVeigh and the now infamous Ryder truck-which was brimming with explosives-when it detonated and erased the lives of 168 people, including 19 children. Yeakey rushed to the blast site, and without regard for his own life, began pulling people from the rubble one by one. Instead of being showered with accolades by his government for his heroic efforts, Terrance Yeakey was silenced for what he witnessed in the direct aftermath of one of largest mass murders that the United States has ever seen. No one is quite sure what Terrance Yeakey actually observed at the Murrah building that April morning, but according to all indications, whatever it was he witnessed did not sync up with the official narrative released by the United States government. Officer Terrance Yeakey began compiling evidence against the tale put out by federal officials and stored his findings in a storage facility outside of El Reno, Oklahoma. The data he was accumulating was also in direct contradiction to “the facts” being reported by media outlets worldwide. According to friends and family, Terry began being intimidated by federal authorities because of his personal pursuit for truth and the information which he possessed. He was being pressured to put an end to his independent investigation.